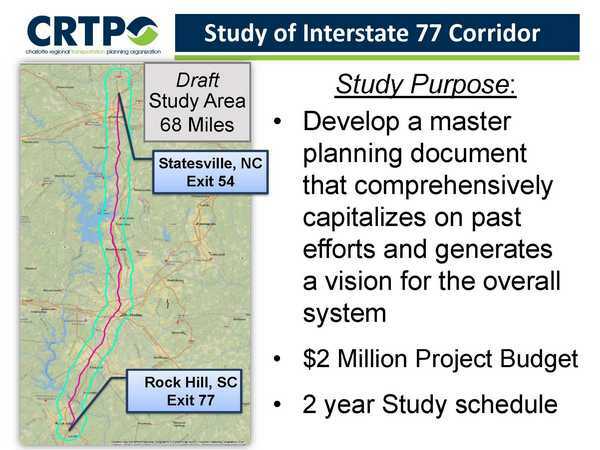 The I-77 Corridor Study will comprehensively capitalize on past efforts and generate a vision for the overall system as well as identify strategies for achieving the vision through an ongoing collaborative community engagement process. The study will be funded using $2 Million of NCDOT State Planning and Research Funds and is anticipated to be completed within 2 years. The draft project limits are from Statesville, NC at exit 54 (US-21) to Rock Hill, SC at exit 77 (US-21) which is approximately 68 miles. In Winter of 2017, interest meetings with elected officials from jurisdictions along the corridor and stakeholder agency leadership were held. The attendees provided meaningful feedback and expressed their thoughts on the significance of the study. Technical scoping meetings were held with the Technical Coordinating Committee members from varies municipalities along 77. A draft technical scope and study area was outlined during these meetings and used to develop the advertisement of the RFQ for the study, which closed on August 7th. On October 22, 2018, Charlotte City Council approved the execution of a municipal agreement with NCDOT to accept funding and negotiate the consultant contract. Atkins Inc consultant firm was selected for the study and the contract negotiations process is underway. This process is anticipated to conclude by February 2019.